It’s that time of year your neighbors, co-workers, and friends are dropping off a plate of Christmas cookies! Ever wonder what craft beers pairs with your favorite holiday classics? 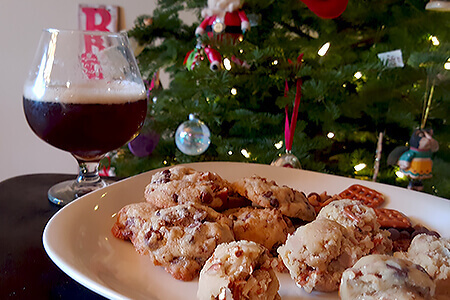 We did the research on four cookies recipes so you could impress your friends with your beer and holiday cookie pairing knowledge. You’re holiday cookie tray isn’t complete without fudge! We went with the standard fudge recipe on the back of the marshmallow cream that your grandmother’s grandmother has been making for years. Since fudge is very rich, a basic brown ale would go perfectly to offset the richness! 1. Mix butter, sugar and milk in a saucepan. 2. Heat until 230 degrees on a candy thermometer. Or if you do not have a thermometer, bring to a rolling boil, constantly stirring for 4 to 5 minutes. 4. Stir in candy chips a little at a time until melted. 5. Stir in the rest of the ingredients. 6. Spread into a greased 13″ by 9″ by 2″ pan. A fun twist on oatmeal cookies, cranberries are added instead of raisin and then dipped in white chocolate and drizzled with pecans. Due to the tart cranberries, we paired this beer with a sour ale. 7. Place heaping tablespoon-sized balls of cookie dough onto a parchment lined cookie sheet. 8. Bake 8-9 minutes. Cookies may look a little undercooked in the center, but the continue to cook and firm as they cool. Do not over bake. If cookies look cooked (not a little undercooked) when you take them out, they are probably overcooked. 10. Once cookies are cool, melt white chocolate chips in a small bowl. 11. Dip cookies, one at a time, into white chocolate chips and shake to remove excess white chocolate chips. Set on parchment paper to dry. Sprinkle with crushed pecans before the white chocolate chips dries, if desired. Another classic cookie that is fun to make as well as pair is the decorated sugar cookie. This recipe works great for cut-outs and works well with using colored sugars or decorating. Because sugar cookies are light, we paired this with a pilsner. 1. In a large mixing bowl, cream together butter and sugar until light and fluffy, about 2 minutes. Add in egg, vanilla extract, and almond extract and mix until combined. 2. In a separate bowl, combine flour, baking powder, and salt. Make sure to spoon the flour into your measuring cup and level it off with a knife to ensure accurate measurements. 4. Roll the dough between 2 sheets of parchment or wax paper and place on a baking sheet in the refrigerator. 5. Chill for about 20-30 minutes. 6. Cut dough into shapes with cookie cutters and transfer to a baking sheet. Sprinkle with colored sugars and bake at 350 degrees for 8-12 minutes. 7. Cool on baking sheet 5 minutes, then transfer to a baking rack to cool completely. Our last cookie is a twist on the classic that Santa is sure to love! You’ll never make just chocolate chip cookies again without adding pretzels and peanut butter chips! This batch only makes 24 cookies, so double it to make more! These cookies disappear off the plate quickly. 1. In a medium bowl, sift together the flour, baking soda, and salt. Set aside. 2. In a larger bowl, beat the butter and sugars together on medium speed until light and fluffy (about 2-3 minutes). 3. On low speed, slowly add the beaten egg and vanilla extract. Beat to combine, scrape down the sides of the bowl. 4. Add the flour mixture and beat just until there are no more streaks of flour. 5. Stir in the chocolate chips, peanut butter chips, and pretzels. 7. Preheat the oven to 350F. Line baking sheets with parchment paper. Scoop out well-rounded tablespoonfuls of the dough and sprinkle with pretzel salt. Leave about 2 inches between each ball. Bake for 10 minutes. If you prefer crispier cookies increase the baking time by 1-2 minutes. 8. Allow the cookies to cool on the baking sheet for a few minutes before removing.